The latest rural idyll threatened with destruction is the medieval village of Pödelwitz, in the eastern state of Saxony. Its quaint timber-framed houses stand empty and only 27 out of 200 villagers remain because mining company MIBRAG wants to dig up the coal that lies beneath. Elke Konrad, 62, lives in a neighboring village and has known Pödelwitz all her life. "It's such a shame," she laments. "The character and charm of the place has gone. There's nothing left." MIBRAG says 90 percent of Pödelwitz's residents agreed to sell their property and move. The company acknowledges relocating communities is difficult but says it "can ultimately be a new opportunity for those involved." But in recent days, hundreds of protesters have pitched tents on the green in front of Pödelwitz's church. They've already seen villages cleared in the states of Rhineland and Brandenburg, but hope to save this 800-year-old hamlet. Christopher Laumanns, from the city Leipzig, is one of the climate activists camped out in Pödelwitz. He says that since Merkel made the decision to switch off nuclear power, 3,000 people have been displaced in Germany because of mining for lignite — the technical name for brown coal — and another 2,500 are currently in danger of losing their homes. "Germany needs to wake up and people need to see that it's not the green icon that it is often portrayed as," Laumanns urges. Lignite is a low-grade, waterlogged form of coal, mined from vast, shallow, open pits. It's considered the dirtiest of coals because it is inefficient. Greenpeace warns that for the same amount of energy extracted from high-grade anthracite (black, hard coal), burning lignite releases between two and four times as much CO2 into the atmosphere. Germany primarily uses brown coal for electricity and the chemical industry. Last year, 37 percent Germany's electricity was powered by coal, and 23 percent of it by brown coal, according to the Economy Ministry. That is undermining progress the country has made in expanding cleaner, renewable energy production. 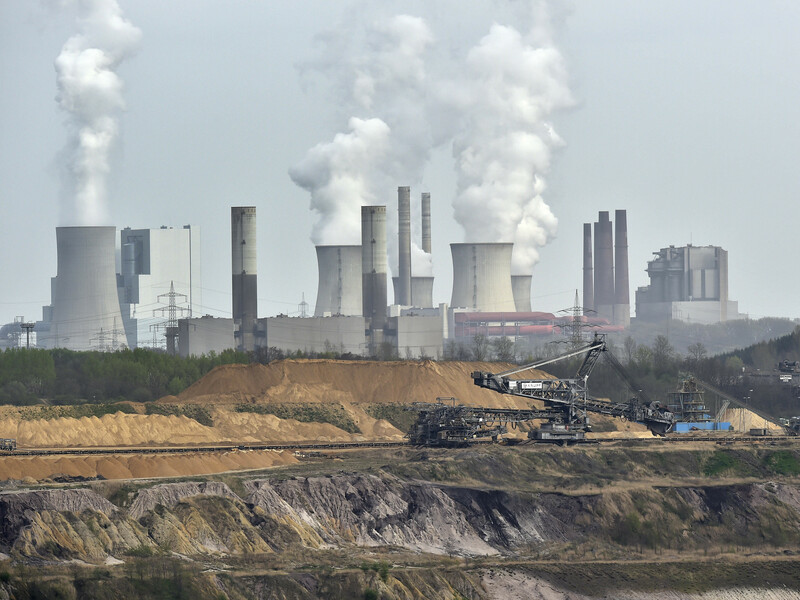 According to the Brussels-based climate policy think tank Sandbag, seven of Germany's brown coal mines are among the top 10 biggest polluting power plants in Europe. And yet, Germany still aims to reduce its carbon emissions to 40 percent below 1990 levels by 2020. Laumanns says that with brown coal usage so high, Germany will struggle to hit both this target and its 2030 target of a 55 percent reduction. "This country is investing a lot of money in the energy transition, but it's not actually reducing its CO2 emissions," Laumanns says. The irony is not lost on local farmer Jens Hausner. From his farmyard, you can see the coal plant that's threatening his livelihood, but you can also see wind turbines on the horizon. He says the contrasting view is an apt analogy for the country's confused climate policy. "In Berlin they're talking about how to phase out coal, but here in Saxony, they're scaling it up as if it wasn't an issue," Hausner complains. A newly formed coal commission — a group of experts, industry representatives and environmentalists — has until the end of the year to come up with a coal phaseout plan. Stefan Kapferer, the head of Germany's largest energy sector lobby, which includes coal companies, sits on the commission. He says that for an industrial giant like Germany, the European Union's leading economy, it could take another 20 years to shut down coal use. "The coal plants belong to companies who have ownership rights," he says. "So if you're going to insist they shut down, appropriate compensation has to be awarded." He adds, "We've got to ensure that our chemical, steel and aluminum industries can access and afford the electricity they need." But back in Pödelwitz, on the edge of the village at the gates to the coal plant, Thomas Güter disagrees. Güter is a miner and he feels vulnerable, despite being a union member. "It's so, so unfair," Güter grumbles. "Nobody ever talks about the advantages of brown coal, what is does for the region economically or the energy security it provides." Güter is a fourth-generation miner. He's never known anything else. He says there aren't any other decent manual jobs in this region. But he may not need to worry. If Germany continues to drag its feet over how to give up its dirty coal habit, 52-year-old Güter will probably work at the pit until retirement.